Currently, I am working on TensorFlowSharp Simple Test using Workbook. It will helps if I could paste the Tensorflow Python code onto the document and write the TensorFlowSharp code in Workbook. 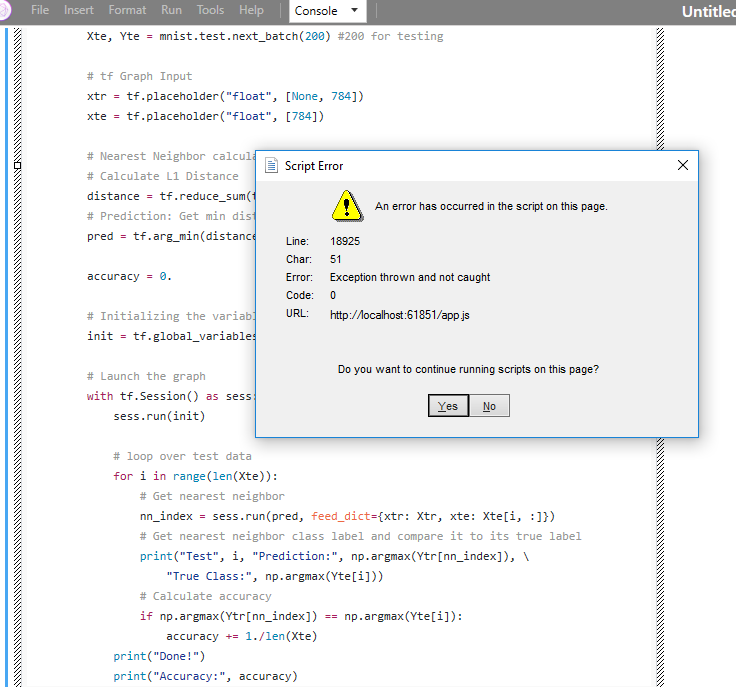 Using the latest version of Workbook, pasting python code onto the Code format section of the document results in Error and it is not possible to save the workbook with the python code pasted in the document section under "Code". Thanks for all the extra info. We'll investigate. I doubt this is fixed in 1.3 yet, but information about the release is here: https://developer.xamarin.com/releases/interactive/interactive-1.3/ . What version of Workbooks are you using? 1.2.2 is latest stable, but there is also a 1.3 preview in the alpha channel. Can you please share your client log files? When you say "pasting python code onto the Code format section of the document", do you mean you are pasting into a C# code cell? What application are you pasting python code from? 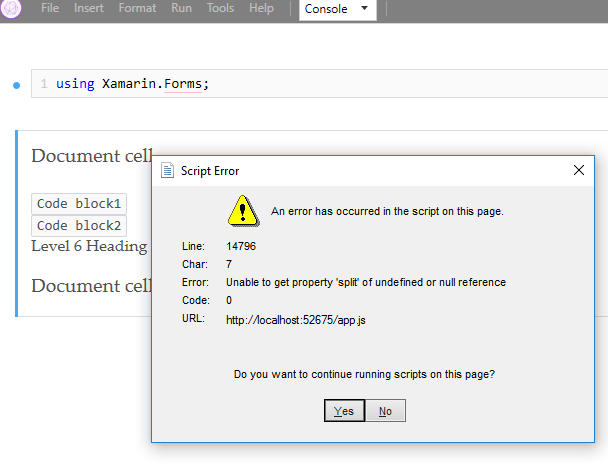 Version 1.2.2 (currently Xamarin beta channel) where I read about Version 1.3 and bug fix? FYI: I am using the github to get the Image URL link. Every time I am down far below the workbook, Entering new code into the cell and running the code sometimes bring me back UP to the top of the notebook. I have to again scroll down back to below to continue entering the code. => perhaps there is something I have done wrong, perhaps this is something you have seen. Yes, there are some bugs in auto-scroll code, and they are on our list. Thanks!